As mothers, we have the amazing opportunity to nourish, protect, and heal with just one simple thing provided within all of us: our breast milk. Since breastfeeding can definitely be challenging it’s important for us moms to know and be encouraged by it’s many benefits. The milk that our precious babies yearn for provides an incredible amount of healing, growth and protection, not just for them but also for you! Check out these seven surprising benefits of breastfeeding that are sure to give you more confidence and encouragement as you feed your little one during the first year of life or however long you may choose. It is important to note that these studies, which support breast milk’s power to develop infants’ cognitive ability are based mainly on observation and could contain confounding factors such as minor differences in mother-baby interaction. However, it’s still awesome to know that our milk can contribute to growing our babes into Little Einsteins. 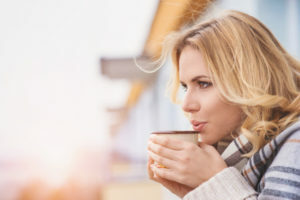 Breastfeeding releases prolactin, which is necessary for keeping the levels of estrogen and progesterone, hormones necessary for menstruation, at bay. This means that if you are not exclusively breastfeeding, and are not releasing enough prolactin, menstruation and ovulation can occur. More prolactin out + exclusive breastfeeding (no bottle or formula) = a nice vacay from that monthly present! Babies that are breastfed, either exclusively or partially are less likely to experience sudden infant death (SIDS). Therefore, the CDC recommends that babies are breastfed for at least 6 months or for as long as possible in order to reduce the likelihood of SIDS. This might be a scary benefit, especially if you are unable to exclusively breastfeed and have to introduce a bottle, but don’t be alarmed. 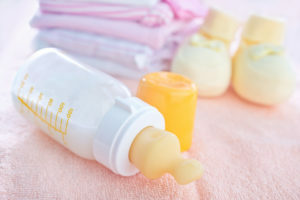 As long are you are taking the necessary precautions to prevent the likelihood of SIDS, introducing a bottle and breastfeeding as often as possible during the first few months of life should be enough to help protect your little one. Breast milk contains about 20 calories per ounce. Babies from about 1 month old are given approximately 2 or more ounces per feeding and are to be fed about 8 to 12 times per day. According to my math, that is at least 320 calories shed without lifting a weight or doing any cardio! This will definitely help to shed most of your postpartum baby weight and increase your energy. You may be able to say hello to your post-baby body earlier than expected! It is very important that since you will be losing so many calories through breastfeeding, eating properly and maintaining a balanced diet is crucial for both the health of both you and your baby. If you are breastfeeding, it is important to continue, regardless if you are or think you are becoming sick so that your baby can benefit from the antibodies needed to ward off illness and viruses that cause cold or flu. This might be the most surprising benefit and you might be wondering how someone figured this one out, but it is true nonetheless. Not only are breast-fed babies less prone to having baby acne, but also sources show that the lactic acid in breast milk make for a great facial cleanser and eye makeup remover. Pump your own milk and let it cool down. After washing your face, apply a bit of breast milk all over your face. Rinse with lukewarm water and pat your face dry. Breastmilk has been shown to improve natural glow and reduce the prominence of acne. If you are able and have an overabundance of milk, try it out! Let’s be honest. Being a mama is hard and quite tiring. The good news is that, when done safely (i.e in bed void of loose sheets and pillows or while your partner is awake and able to keep watch), you will find that breast milk is relaxing not just for your baby but also for you! The oxytocin released whilst breastfeeding works to knock both you and your baby out cold, so both of you can get some much needed rest. As my engorged and tingling breasts grew in tenderness and my little one cried, salivated, and ate her wrists in earnest anticipation, it seemed that all I could do was satisfy her hunger. But to my surprise, breastfeeding proved to be one of the most significant and versatile things I could ever do as a mom. So, take heart mamas; if you are currently breastfeeding and facing some challenges, don’t grow weary in doing good. Embrace the superpowers you have lying just beneath your beautiful blouse. Have fun exploring all of the many ways you can help your baby (and yourself) through breastfeeding and don’t hesitate to share the ways these surprising benefits have helped you in the comments section below! How to safely reheat expressed milk. It’s good to know the benefits of breastfeeding. My wife thinks that formula is the best, but I’ll show her this. Our son is going to have a really high IQ if she will breastfeed him!